Today’s COTD is Colima as a Perfect Guard. 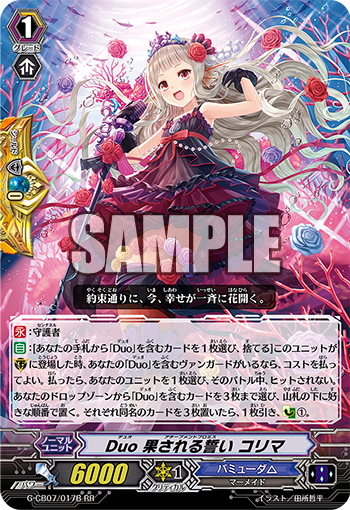 AUTO [Choose a card from your hand with “Duo” in its card name, and discard it] When this unit is placed on (GC), if you have a vanguard with “Duo” in its card name, you may pay the cost. If you do, choose one of your units and it cannot be hit until the end of the battle. Choose up to three cards from your drop zone with “Duo” in its card name, and put them on the bottom of your deck in any order. If you put three cards with the same name, draw a card and Counter Charge 1.